Have a cold? 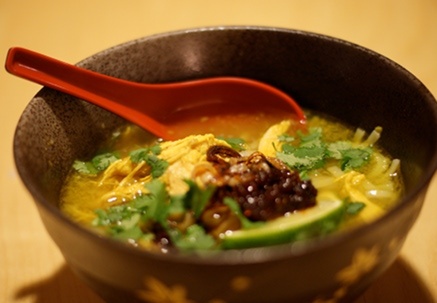 Try Soto Ayam! Adapted from “Cradle of Flavor” by James Oseland (W. W. Norton, 2006). 1. Place chicken in a medium pot with lemon grass, lime leaves (if using), salt and 2 quarts water. Bring to a boil over high heat. Skim off any foam and reduce heat to a simmer. Cover and simmer until chicken is tender, about 45 minutes, skimming as needed to make a clear broth. Remove chicken pieces from broth and set aside. Remove and discard lemon grass and lime leaves; reserve stock in pot. When chicken is cool enough to handle, discard skin and bones and shred meat into bite-size pieces. 3. Heat peanut oil in a medium saucepan over high heat. When very hot, add spice paste and cook, stirring until paste is cooked and beginning to separate from the oil, about 5 minutes. 5. Cook noodles according to package directions. 6. Turn off heat under soup and stir in lime juice. Taste for salt. 7. To serve, divide noodles in large soup bowls. Ladle chicken pieces and soup on top and sprinkle with celery leaves or herbs, and fried shallots, if using. Pass lime and sambal at the table. 8. Eat from soup bowl, or serve a scoop of rice on a side plate, sprinkled with more shallots, and put a mouthful of noodles and chicken on rice. Combine on a spoon, dab with sambal, and eat. This entry was posted on October 27, 2010, 6:59 am and is filed under kitchen, Recipe. You can follow any responses to this entry through RSS 2.0. You can leave a response, or trackback from your own site.